Katsushika Hokusai is the most famous Japanese Ukiyo-e artist in the world, and “The Great Wave off Kanagawa” is renowned as his greatest masterpiece. Mount Fuji sits quietly in the background as the magnificently powerful great wave towers over it. The bold composition and delicate depiction shocked people around the world. The work is well known overseas as “The Great Wave,” and it is said that the composer Claude Debussy took inspiration from it to write the symphonic poem “La mer” (The Sea). “The Great Wave” is still highly acclaimed across the world today and continues to be featured as the main attraction in numerous exhibitions both in Japan and abroad. In 2017, it was sold at a Christie's New York auction for 943,500 dollars, which is the world record for an Ukiyo-e woodcut print. 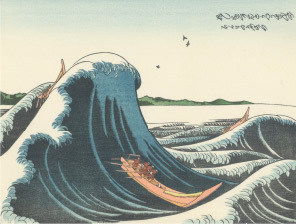 Hokusai was known to portray everything under the sun, but one of his greatest passions was the depiction of waves, a challenge he continued to pursue for his entire life. He drew waves countless sometimes, striving to capture their ever-changing shapes and movement. “The Great Wave off Kanagawa” and “Oshiokuri hato tsūsen no zu,” an early work that is said to be its preliminary model, are similar in their compositions but the way the waves are portrayed is completely different. “The Great Wave off Kanagawa” was the product of Hokusai's never-ending attempt to create realistic and captivating representations of waves. Compared to other Ukiyo-e artists, Hokusai uses more delicate lines in his work, and sophisticated skills are required to carve out the lines in a faithful way. In particular, the nuanced and intricate lines used in the crest of the wave seen in “The Great Wave off Kanagawa” are a true test of the carver's skill. 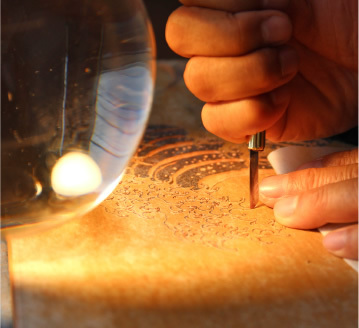 The carver pays careful attention to the rhythm created by the lines and the overall balance as he uses his knife to create the powerfully dramatic composition, and even appreciates the dynamics of Hokusai's paintbrush as he carves out the different lines. 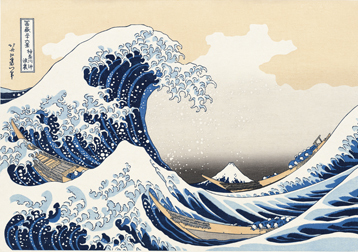 “Blue” was essential to the depiction of waves that Hokusai tirelessly pursued. The synthetic pigment Prussian blue (called “bero-ai,” which means “Berlin blue”) imported from Europe in the late Edo Period was used to print Hokusai's work. 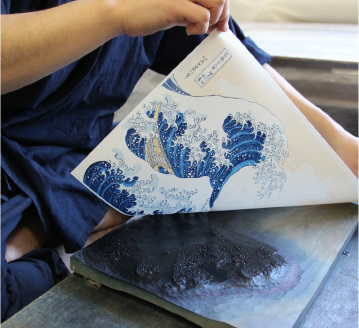 For “The Great Wave off Kanagawa,” Prussian blue was used in two different concentrations to skillfully print one color over the other to create the vividly colored and three-dimensional great wave. “The Great Wave” is highly appreciated the world over as the most important work of Hokusai and Ukiyo-e and is still loved by people today. It is also the most popular among the works we offer. 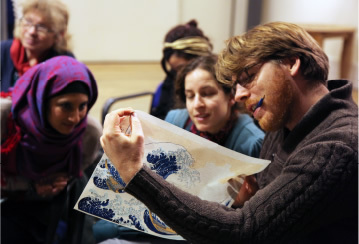 We hope you will see and enjoy “The Great Wave,” created by the artisans at Adachi Institute of Woodcut Prints who have inherited and preserved the Ukiyo-e printmaking techniques of the Edo Period to painstakingly produce each print.